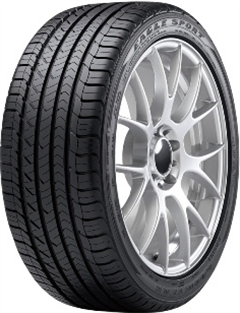 Designed to have strong grip and outstanding responsiveness during summer and winter weather conditions, the Goodyear Eagle Sport All Season does exactly what the name suggests. This tyre is suitable for year-round usage, delivering first-class handling on wet, dry and snow-covered roads. Its full-depth sipes aid with grip, providing confidence throughout its long lifespan. What’s more, Goodyear have added a rim protector to help defend the tyre against curb damage.